Norway’s Aksel Lund Svindal put a punctuation mark on his return to racing Saturday with a downhill win in the Birds of Prey Audi FIS World Cup race week at Beaver Creek. Rounding out the podium were Beat Feuz of Switzerland in second and Thomas Dressen of Germany in third. Wearing the No. 1 bib, Svindal was first out of the start gate, posted his time of 1:40.46, and then waited for the next 70 racers to finish before officially winning his fourth downhill title at Birds of Prey. Feuz, who won last week’s downhill in Lake Louise, Canada, also took advantage of his early start (bib No. 3) and finished with a time of 1:40.61 to grab his third second-place finish in downhill at Beaver Creek. Dressen posted a time of 1:40.95 to earn his first career World Cup podium and the first in downhill for Germany since 2004. Matthias Mayer photo by Erich Schlegel. It was his fourth downhill win at Beaver Creek and his 13th World Cup downhill title. The victory also marked Svindal’s first World Cup win since Jan. 22, 2016, when he captured the Super G at Kitzbuehel, Austria, and his first World Cup downhill win since Jan. 16, 2016, in Wengen, Switzerland. Svindal sat out most of last season after surgery in January to repair a detached meniscus. It was an unexpected blow for the Norwegian, who also had knee surgery in January 2016 after he ruptured the anterior cruciate ligament (ACL) in his right knee during a race in Kitzbuehel. It was enough to keep reigning World Championships gold medalist Feuz at bay by +0.15. The Swiss won bronze in downhill at the 2015 Worlds in Beaver Creek and finished second at Birds of Prey in 2014 and 2011. It was a particularly special day for Dressen, whose best World Cup finish to prior to Saturday was a sixth place in downhill in February 2017 in Kvitfjell, Norway. 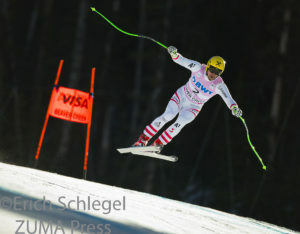 He finished 10th in Friday’s Super G.
“It’s just an awesome feeling,” he said. “It’s just great. To make to my first podium in the U.S. and also here at the Birds of Prey is special to me … I wasn’t prepared for such a good result. Looking to Sunday’s giant slalom, although 2010 Olympic bronze medalist Svindal will sit out to rest his knee, last year’s crystal globe winner, Marcel Hirscher, will be aiming for his third giant slalom win at Beaver Creek. Hirscher is the reigning World Championships gold medalist and has 22 World Cup giant slalom wins. He boasts six other podiums in giant slalom at Beaver Creek. Also returning to action tomorrow is American Ted Ligety, winner of five giant slalom crystal globes. Ligety, who is making just his third World Cup start since back surgery this past January, won the giant slalom title at the 2015 World Championships at Beaver Creek as well as five consecutive World Cup giant slalom wins at Birds of Prey from 2010-2014. Racing continues Sunday at 9:45 a.m. MT with the first giant slalom run, followed by the second run at 12:45 p.m. MT.